So I was sitting in my hobby room tonight trying to figure out what article I was qualified to present to the Librarium as penance for my LPC failure, having some trouble. I’ve done a couple of tutorials that I wasn’t able to submit while the Librarium was down, but it didn’t seem right to recycle something I’ve already done. Not penance enough, right? But there’s not a lot that I can do that’s not already covered or really basic. 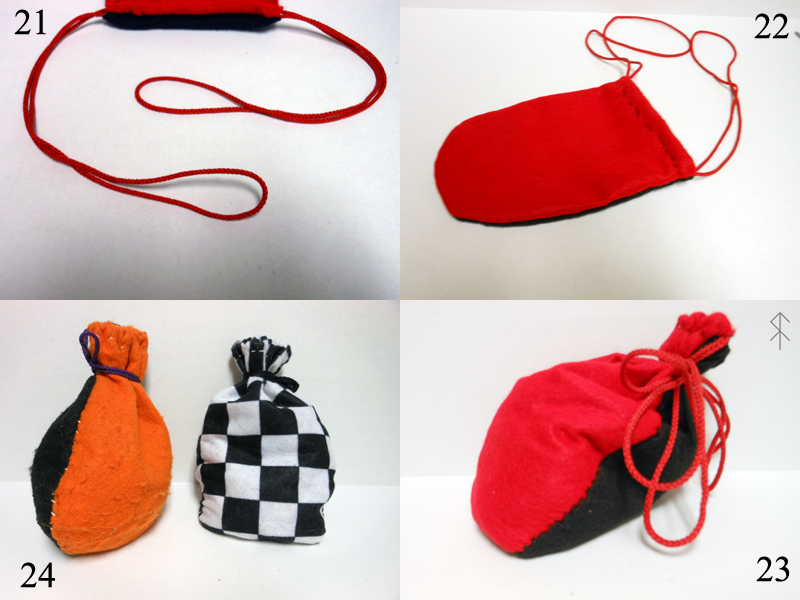 I tried to think of things that were peculiar to my skill set, and the it hit me: my dice bags. 1. So we’ve all got gobs of d6 in various colors, and we need them all. Didn’t get on the bandwagon for the cool B&C dice bag? Don’t feel like paying a lot of money down at the FLGS? Have I got a deal for you! 2. Two squares of craft felt from the hobby store, about 99¢ a piece. For a two color bag you need two, obviously, but for a one color bag just the one. 3. I’m going two color. I cut the pieces in half, and now have two different colored rectangles of roughly the same size. 4. Holding them together I round off the two close corners. This doesn’t have to be perfect. Think hand grenades and government work. 5. 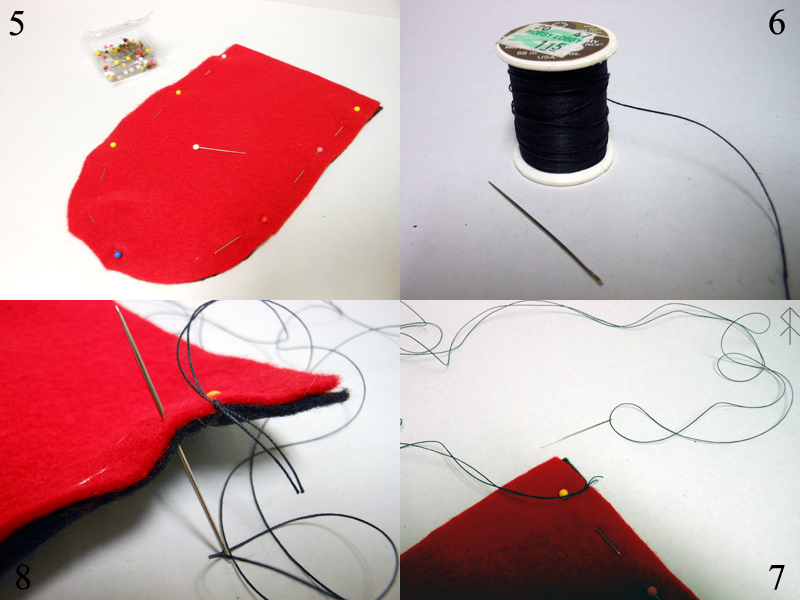 Hold the two pieces flat against each other, and then use straight pins to stick them together. 6. Have some button thread and a sewing needle. Make sure it’s button thread, or stronger, because ordinary sewing machine thread will be too thin. 7. On the square end make a basic stitch, leaving about a thumb’s width free on the ends. I just push it through once and then tie it off in a square not and trim the excess down. 8. Begin a simple loop stitch, at least an 1/8″ into the fabric, making sure to get both sides somewhat equally, and space the stitches about 1/4″ apart. 9. I use long lengths of thread because I hate to run out. It’s easy for the thread to twist and knot up as you’re pulling the thread through, so I keep a finger through the loop as a guide to keep that from happening. It’s a righteous pain to untangle a knot in your needlework because you were in a hurry and got sloppy. Trust me. 10. When pulling tightly on the thread don’t pull from the needle, pull the threads themselves from below the needle to keep the metal of the eye from wearing through the thread. This is especially easy to do if you hold the needle in your lips and the thread gets damp. Bad times if it breaks. 12. Once you get the hang of it, this part goes quickly. I find the steady pace and attention to method relaxing, sort of like painting minis. 13. When you get to the end (don’t forget to leave the thumb’s width free!) 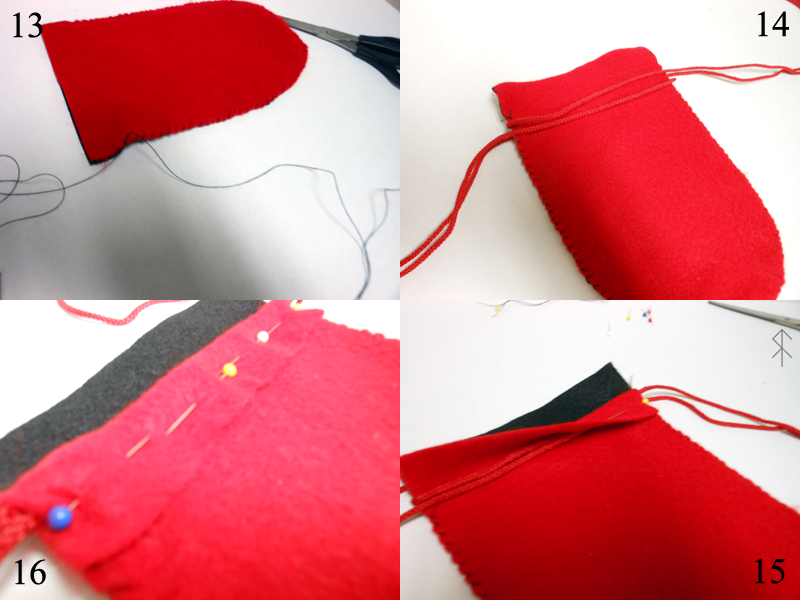 make a final stitch, then carefully pull one of the threads back out of it. Tie these two loose ends together in two square knots then trim down, leaving about 1/4″. 14. Lay two separate pieces of cord for your drawstrings. I got a handful of colorful cord from the hobby store, but shoelaces will do in a pinch. Make sure that both ends are on the same side for each cord, but that each cord has its own side (is that confusing?). 15. Carefully fold down the loose ends (what we left the thumb’s width for) with the drawstrings at pressing at the very top. 16. Slowly stick straight pins through to hold the flaps down, mind that you A. only go through the top layer of fabric, and B. don’t run a pin through a drawstring. You want the straight pins as close to the drawstrings as you can get without crowding them. 17. 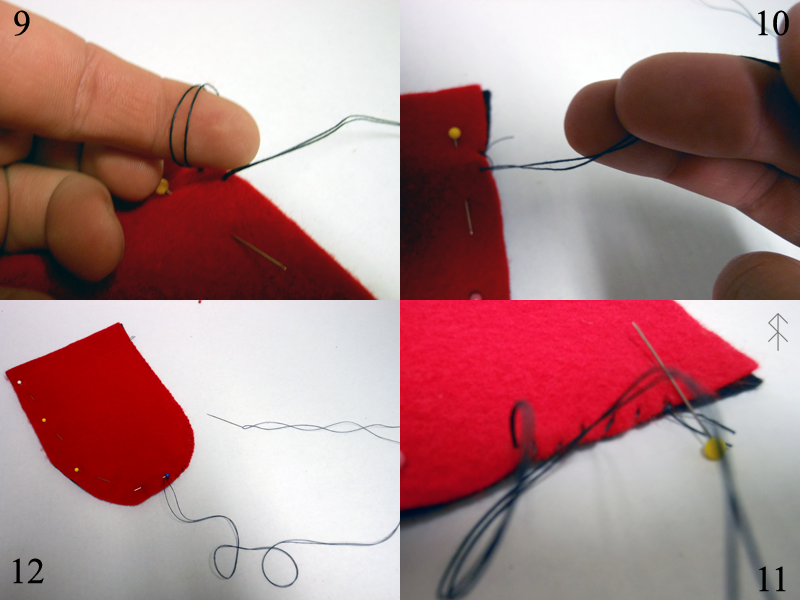 When both sides are secured with straight pins, make a stitch through all four layers on one end. 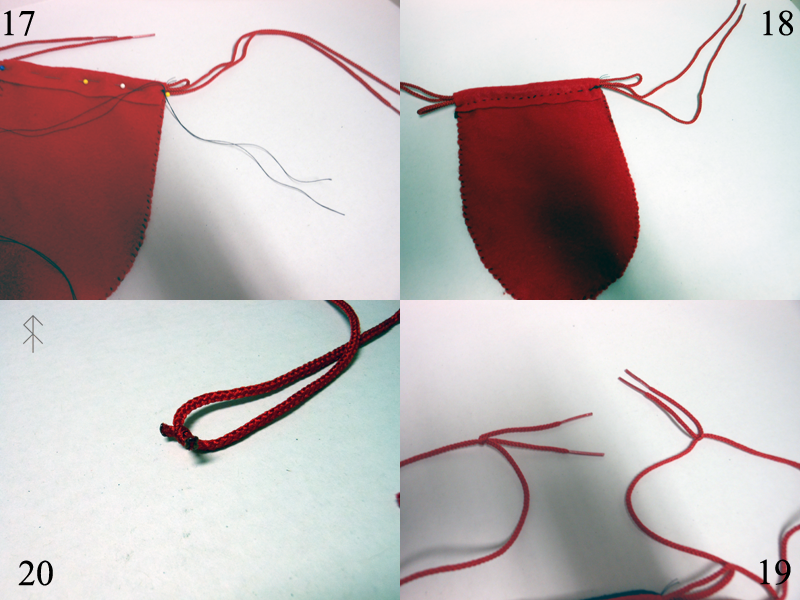 Keep the drawstrings on the opposite side of the straightpins when you’re making your stitches. For this first stitch leave about four fingers length free when you trim the loose ends of the thread. 18. Stitch a simple through-and-back type stitch (these are not technical terms I’m using…) as you go around each side. Leave a decent bit of room as a channel for the drawstrings, maybe 1/2″ or so. I don’t know how to make these stitches neatly myself, but I’ve convinced myself it doesn’t really matter. Go all the way around, and then tie off the extra to the tail you left on the first stich, trimming the ends down after to 1/4″ or so. 19. Going back to the drawstrings, tie a square not in each end, trying to keep the two sets even. Again, if you’re not tying each cord to itself to make two circles, you’ve screwed up somewhere and will have to be creative to fix it. But you’re probably fine, so let’s keep going, because the next step involves fire! 20. Cut the loose ends off the drawstrings, and if you’ve used a synthetic material you should carefully melt the ends with a match or lighter to keep them from unraveling at a later date. FFS do not set your bag, yourself, or anything but the very tips of the loose ends on fire! Get them wet to make sure they’re not hot, because you don’t want to melt the craft fabric, which is probably acrylic based. 21. Tuck the knotted ends into the channels you’ve sewn. This is purely for looks. 22. Turn the whole contraption inside out, so that the stitches and knots are hidden and the whole thing looks clean and neat. 23. 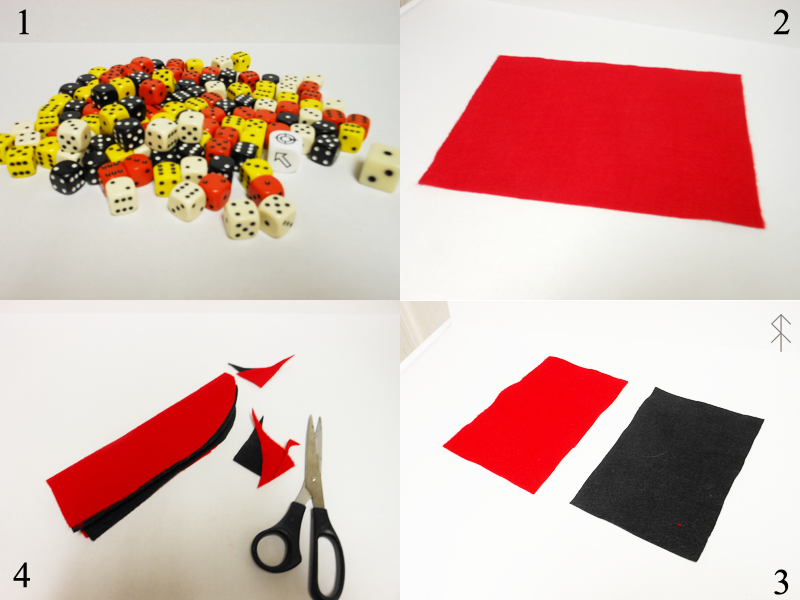 Fill your new dice bag full of your many dozens of various colored little d6! 24. The hobby store should have a wide variety of colors and designs, and if you play many other wargames or RPGs you’ll probably have a ton of dice, like me. The orange and black bag is for my 40k dice, the colors chosen to match my Chaos Space Marine warband’s colors. The black and white checked bag was recently created for my RPG dice, because I was tired of pouring out pounds of dice a couple of times a week depending on what game I was going to play. This whole process took me less than the length of an ‘Erasure’s Greatest Hits’ album, so they’re easy to knock out once you’ve got the knack of working with needle and thread. I certainly hope this is useful or interesting to my brothers of the Legio, helping them to keep their necessary gaming accessories well disciplined and ready for transport in an instant’s notice, as well as due penance for my crimes against painting this year.